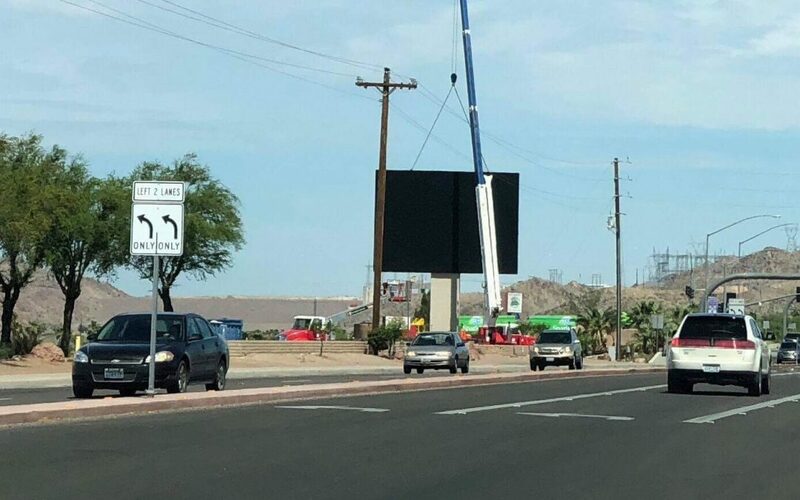 BULLHEAD CITY—An electronic advertising board is currently being installed along Highway 95 near the Laughlin Bridge. The board is under the control of Laughlin Family Trust, according to a contract provided by Toby Cotter, City Manager of Bullhead City. The contract states the new board replaces an older, nonconforming sign. In addition, the city will be allowed eight seconds per minute for official city purposes. In December, the Planning & Zoning Commission approved a similar deal with Lamar Advertising for two digital billboards. The first digital billboard was installed near the intersection of Highway 95 and Riverview Dr and the second by McCormick Professional Plaza off Highway 95 across from the Target shopping center. Why do we want huge billboards? Modern city codes limit the size and the height of advertising signs. That new sign is an eyesore in our city. Who recommended the installation of these signs? We have the modern internet to promote community activities. The signs are as stupid as a Roundabout in the middle of a commercially zoned intersection.